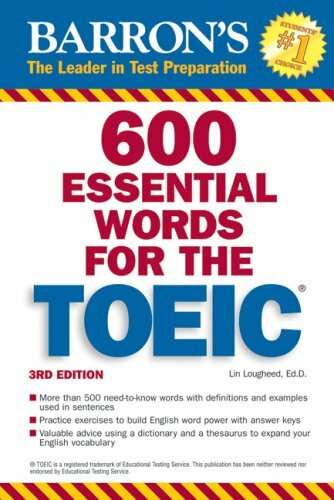 [PDF] 600 Essential Words for the TOEIC: with Audio CD (Barron's Essential Words for the Toeic (W/CD)) | Free eBooks Download - EBOOKEE! Posted on 2018-01-10, updated at 2018-02-26, by luongquocchinh. Description: This edition has been revised to match the format of the latest TOEIC and includes fifty vocabulary-building lessons that focus on American English as it is used within the context of modern business, industry, communications, and cultural activities. Examples of practical English usage touch on such subjects as contracts, marketing, banking, and personnel, among many others. Additional lessons concentrate on helping TOEIC test takers expand their English vocabulary in areas related to cultural activities, such as movies, museums, music, and art. Each lesson presents 12 target words with definitions, used in several different contexts. Exercises follow every lesson, and a quiz follows every five lessons to test students' newly acquired skill in understanding and using their new words. The enclosed audio CD provides essential help in pronunciation and listening comprehension, using the various accents tested on the new TOEIC. No comments for "[PDF] 600 Essential Words for the TOEIC: with Audio CD (Barron's Essential Words for the Toeic (W/CD))".